The right software for your pest control business can have a dramatic impact on your productivity. Get organized, and get everything into one trusted software platform. Fieldwork keeps track of your clients and can even automatically send out emails reminding them to pay, following a pre-set reminder schedule at whatever intervals you choose. No more hours spent chasing after money that you're owed. Enjoy insight into your operations like you've never had before with intuitive dashboards that chart growth, revenue, costs, employee performance and more. Combined with our automated data collection, you'll spot trends sooner and react faster to data points that could guide your business. Tasks are the easiest way to stay on top of things and make sure you don't forget something. Sometimes a work order or a note isn't enough. You can assign tasks to customers, work orders, estimates, invoices, anything... You'll have them all in one place and everyone loves the feeling of crossing an item of the list. Fieldwork users enjoy the most sophisticated calendar and scheduling tools on the market. Easily set up recurring work orders, drag and drop jobs between technicians — all on your mobile device. Keep track of jobs pending completion or scheduling — and never miss an appointment again. Move your business into the 21st century and take payments right in the field. Intuitive credit card payment interfaces seamlessly with signed contacts and invoices. For bills sent automatically, customers can also easily pay via a convenient online portal. Keeping accurate chemical use records is essential for many industries. With Fieldwork you can easily record your usage in the field and report on it back in the office. We provide detailed chemical use reports for both New York (PRL) and California. Cash flow is the lifeblood of your business. With our invoice and payment tools you can fully automate your billing process with email and batch invoices in just minutes. If you prefer the old fashioned way, you can also use the software to cut hours off printing and mailing invoices to your clients. Fieldwork provides customer service for your clients even when you're out of the office. Using a simple and intuitive portal, customers can remain up-to-date on project progress and any invoices that are due. They can even pay directly online for maximum convenience. Reporting doesn't have to be a necessary evil. Fieldwork makes tracking any aspect of your business effortless, from chemical usage to specific implement effectiveness. The results won't just help with regulations — they'll help you run your business smarter, too. Stop doing paperwork. Start doing Fieldwork. No more miscommunication, no more driving back to the office for missing paperwork. Get your entire team on the same page with Fieldwork's calendar, tasks, notes and more. Business owners, administrative staff and technicians have 24/7 access to critical data with the ability to work seamlessly from a PC, tablet or smart phone. Fieldwork automates the busy work so you can focus on client relationships and growing your business. Our crm makes building customer profiles, scheduling repeating or one-time appointments, sending appointment reminders and drafting invoices and more a breeze. When you need answers, our dashboard and reporting system have you covered. 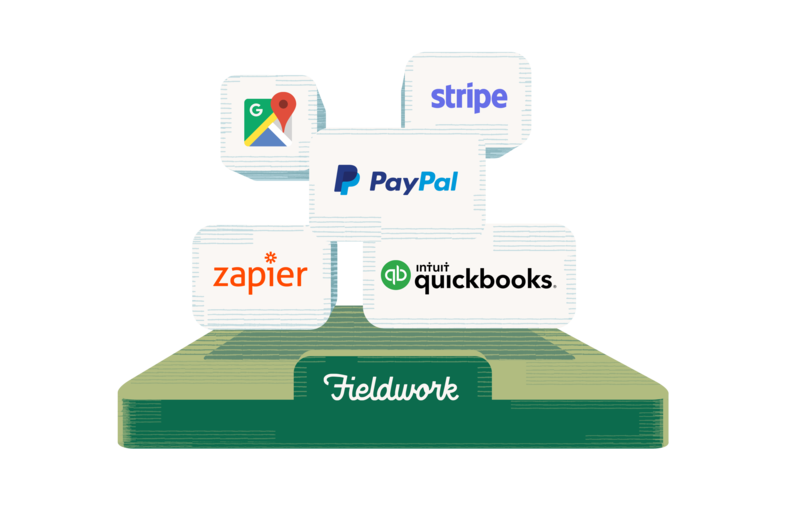 With Fieldwork, getting paid is simple and convenient for your customers. We'll keep track of invoices and allow you to process payments conveniently through the mobile app, over the phone or in your customer portal. Settling customer accounts doesn’t require an accounting department we’ll keep track of everything and send payment reminders, helping you get paid faster. Some field service software makes you buy a whole suite of new tools you don’t want. Fieldwork adapts to exactly how you do business now, integrating with what works for you.